Last year at this time, I wrote about how to get along with difficult people at the holidays. Luckily, that is not a problem I am currently facing! We are in Atlanta on Day 174 of our vacation, celebrating with congenial family members. 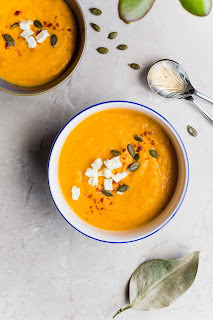 Although the picture I chose to illustrate this post is a stock photo by Cala on Unsplash, it looks a lot like the delicious butternut squash soup my sister-in-law made for us. Steve and I are very thankful for everything we have been able to do, for everything we have, and for the love and support of all our family and friends.